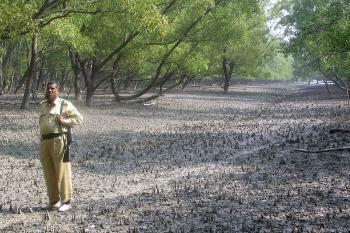 The Sundarbans ('Forest of Sundari trees') are one of the largest remaining areas of mangroves in the world. The site also has exceptional biodiversity, notably about 400 Bengali tigers. Its ever changing landscape is shaped by tidal shifts, rivers and creeks. 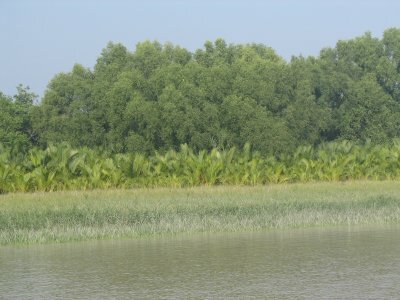 The Indian part of the Sundarbans area is a separate WHS, under the name of Sundarbans National Park. The Sundarbans are the closest thing to a tourist attraction Bangladesh has. I took a one day boat trip to the newly established visitor center at Harbaria. You'll have to spent several days to get really deep into this large park, but to me this trip was fine. We first sailed (on a small motorboat) along the coastline, thickly covered with forests. We saw a number of kingfishers, some dolphins and a crocodile on our way. We would have liked to see a Bengal tiger of course, but they are rare. 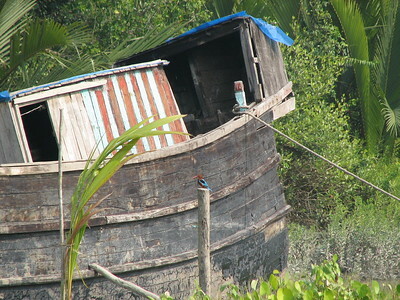 My guide and the boatsmen had seen one here in November 2006, not far from Mongla town. After 4 hours we arrived in Harbaria, where we did get ashore. We were assigned with a man with a gun. Together we walked the trail that has been laid out here that lets one get the feeling of being in the 'real jungle'. Having a man walking in front of you with a gun really helps to get a spooky atmosphere (maybe the tiger is looking at us from behind the trees). If it's really that dangerous, it would help to have a man with a gun walking behind us too. 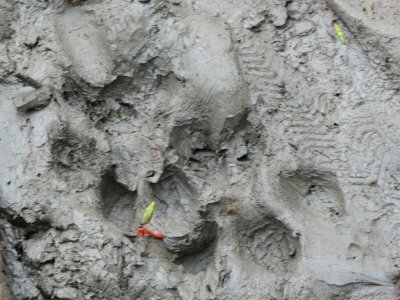 The highlight were the tiger foot prints, left in the mud some time before. I was in Sunderban, West Bengal quite a number of times to conduct a study of mental health status and needs of the survivors after two years of disaster due to Aila ( name given by Maldwip for separate identity), that occurred on 25th May, 2009 in the Southern parts of West Bengal and Bangladesh because of formation of devastating cyclone in the Bay of Bengal . While conducting my study at 8 No. Khaikhali and Deulbari, in the Kultali Block; P.O.- Ashram , I met some of the affected people like Nirupada Mondal (Fisherman), Nirmal Naskar (Autorickshaw Driver) , Rabin Naskar (Boatman), Ramini Das( Runs rented shop in Ram Krishna Mission, Khaikhali), Bishnu Pada Sardar (Farmer).... they narrated the horrible situation in Aila cyclone-affected villages of Khaikhali and Deulbari. It was not just an opportunity for me to extend my understanding of extent of disaster but also to listen to the needs of people struggling for survival. According to Nirupada Mondal immediately after disaster the survivors in the villages have been facing scarcity of food, drinking water because of the fact that sea-water ruining their freshwater ponds, and that was responsible for several survivors suffering from diarrhoea after having no choice but to drink the saline water, and loosing the means of earning livelihood as they have traditionally been dependant on agriculture that has been ruined by the saline water from Bay of Bengal that had entered their farms. The Sundarbans are badged as “The largest mangrove belt in the world, the habitat of the famous Bengal tiger...” In order to visit them you will need to go by boat, but how exactly you achieve this will depend on why you are going! 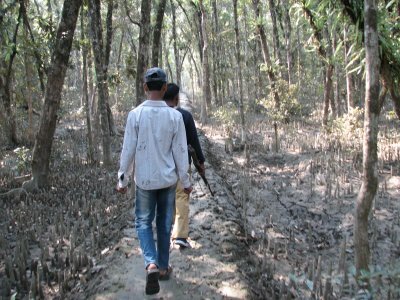 If you just want to get a quick feel for the forest/mangroves and to tick off another WHS, a short trip to the nearest Forest Station in the park can be arranged by local boat on arrival at Mongla, a few miles north of the park boundary and reachable by bus from Khulna (the 3rd largest town in Bangladesh). There you can disembark, pay the forest fee and do a short walk with a guide and be back to Khulna inside a day. There are however a number of “cruise boats” offering trips through the Sundarbans and out to the Bay of Bengal lasting several nights. We chose (and arranged via their Web site) a 3 night trip operated by a company called “The Guide Tours”. I can’t of course state that they are the best but they did everything they promised and provided a “clean” well run ship (They operate 3 and ours had 6 cabins with 12 bunks) with reasonable food and pleasant “public areas”, an English speaking guide with good wild life knowledge and a couple of excursions each day either by boat (a local craft rowed from the stern – important to maintain silence) or on foot (with gun toting park staff – see photo). We found the experience of travelling through the channels of the Sundarbans, seeing the sun rise and set in the misty total silence and viewing the wild life well worthwhile and something of a pleasant break from the hassles of travelling this crowded country! Discount the idea of seeing a tiger – our guide and the visitor’s book on our ship showed that the possibility is a bit above nil – but not by much! Cetacean and bird lovers should be better served however – we saw both Ganges and Irrawaddy River dolphins. On the walks we saw monkey, deer and wild boar but the nearest we got to seeing a tiger were the claw scratches on some of the trees – at a disconcertingly high level showing the size of the creatures (by the way, if you do want to see tiger we would recommend Kanha in India)! The botany of the area is also quite interesting with its specialisms for handling the salinity and the surprising variety of niches as sandbars appear and develop into islands and forests through various stages which a good guide should be able to point out if you aren’t an expert – but be ready for some pretty muddy walking inside the mangrove forest! The other passengers are likely to be Expats working in Dhaka or middle class Bangladeshis (possibly causing some problems if your interest is wildlife and theirs is to have a holiday escape from Dhaka and to swim in the Bay of Bengal?) – there are few tourists in this country. Which is a shame – the current Government Tourist Office slogan is “Visit Bangladesh - a beautiful surprise” which is just about right. a. When the Indian Sundarbans were inscribed in 1987 it was suggested that the site be increased to include the (larger) Bangladesh Sundarbans. When Bangladesh got its area inscribed in 1997 it was again suggested that the 2 sites be merged into 1 trans-national site. But international cooperation does not seem to exist to bring this about. As far as I am aware the Indian area is similar ecologically to that of Bangladesh apart from being significantly more saline as salinity increases from east to west in the Sundarbans. 26 Community Members have visited.